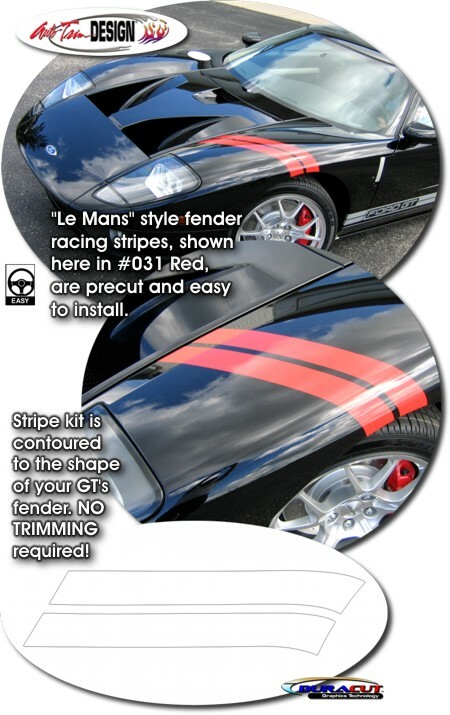 Trick out your Ford GT with our unique "Le Mans" Style Racing Fender Stripe Kit! Kit is precut and contoured to the shape of your '05-'06 Ford GT's fender - NO TRIMMING required! Available in various colors (shown in #031 Red), stripe set has an overall width of approximately 6" (152.4mm) which consists of two (2) 2.7" (68.58mm) stripes with 0.7" (17.78mm) spacing. Looks Great! Note: Since stripe kit is contoured and shaped to the fender and wheelwell opening, Left Fender (shown) and Right Fender kits are available.